Some people are fanatical about fine wines. Some venerate truffles, still others worship the morel mushroom. Today, we salute a food that stands shoulder-to-shoulder with the best -the chicken wing. It’s said that chicken wings are so delicious because of the high skin to meat ratio. Whatever the reason, when prepared properly, chicken wings are the most flavorful, tender and succulent of meats. In short, chicken wings are GOOD. We’ve cooked a lot of chicken wings and we’ve tried a lot of recipes and some are better than others. This one is great. Versions of this recipe have been floating around the internet for several years now. Many have claimed it as their own, but our exhaustive research has finally revealed the original source. (OK, we actually found it in a Bon Appétit magazine dating from July 1990, but we wouldn’t have found it if we hadn’t been looking.) While it’s probable that some version of this recipe pre-dated it, this seems to be the version that has been shamelessly plagiarized practically word-for-word for years. Of course, we couldn’t leave well enough alone and had to tinker with the recipe, adjusting the ingredients and applying some of the chicken wing knowledge that we’ve acquired over many years. Chicken Wing Fact: Experience has shown that fresh wings are the best, hands down. 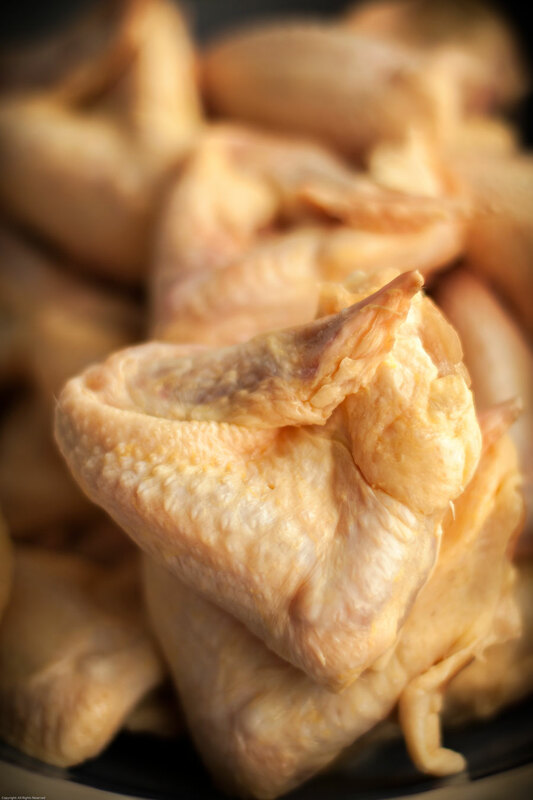 If fresh wings are absolutely unavailable, frozen can work, but use the best quality you can find. It does make a noticeable difference. The glaze used here is pretty simple: mustard and marmalade, plus a few other ingredients. Any good quality mustard, from stone-ground to classic Dijon, will work – as long as it isn’t that bright yellow stuff. We used one of our new favorites, Founders Centenniel IPA Honey Mustard. It’s already got a subtle hint of honey with a mild hoppy bite from the Founders Brewing Co. India Pale Ale used to make it. The addition of a little curry powder does something amazing to the flavor of the glaze. Curry powder can easily overpower a dish, but in this case, the opposite is true. The sweet spices add just the right amount of aromatic flavor to the glaze and somehow marry the bite of mustard to the citrus tang of the marmalade. It’s nothing short of genius. We only wish we could say it was our original idea. 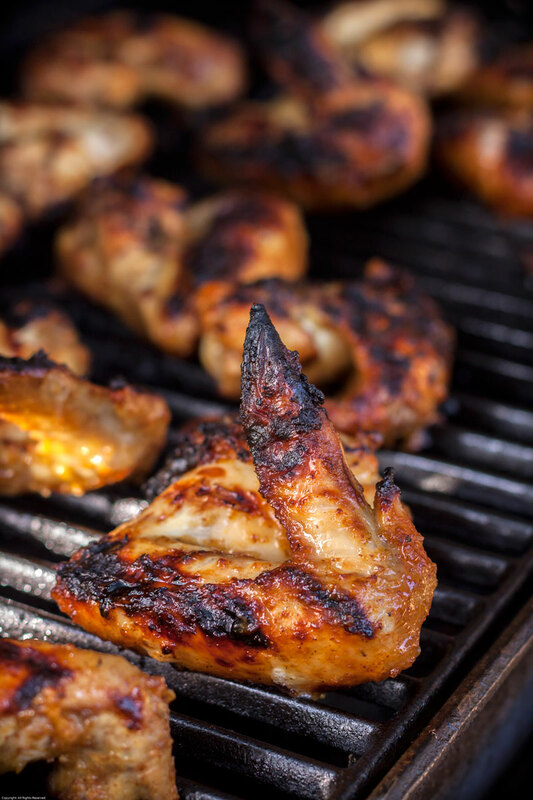 When grilling chicken wings, it’s easiest if you leave them whole instead of separating them at the joints. 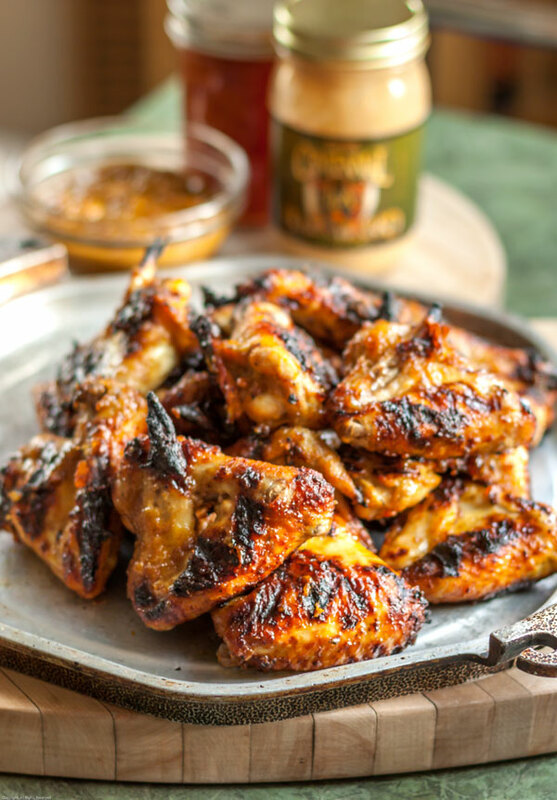 We love the wing tips, which get crispy enough to eat bone & all when cooked on the grill. Prepare the glaze by combining the first 5 ingredients and bringing them to a simmer in a heavy-bottomed saucepan. Reduce to low and cook for 5 minutes, stirring constantly. Remove the pan from the heat and allow to cool to room temperature. Note: The glaze may be prepared up to three days ahead and kept covered tightly in the refrigerator. Allow to return to room temperature before using. Fold the chicken wings so the tip of the wing is tucked tightly against the back of the “drumstick” (see picture). The wings will cook more evenly and remain juicier this way. Put the wings into a large non-reactive bowl. Pour about 1/3 of the glaze over the wings, setting aside1/3 for basting and reserving the remaining 1/3 for serving at the table. Toss the wings with the glaze until well-coated. Cover with plastic wrap and allow to stand at room temperature for an hour to marinate. When ready to cook, remove the plastic and sprinkle generously with salt & pepper, tossing again. While the chicken is marinating, prepare a charcoal or gas grill. If using a gas grill, heat to medium. If using charcoal, wait until the coals are completely covered with a layer of grey ash, them spread them evenly into a single layer. Spread the wings evenly on a well-oiled grate and close the lid. Turn the cooking wings frequently to prevent burning and move them around the grill for even cooking. Brush the wings with glaze every couple of turns and don’t worry if the wings become “untucked” – they’ll taste just as good. Cook for 30 to 35 minutes, or until the wings are deeply browned and cooked all the way through. 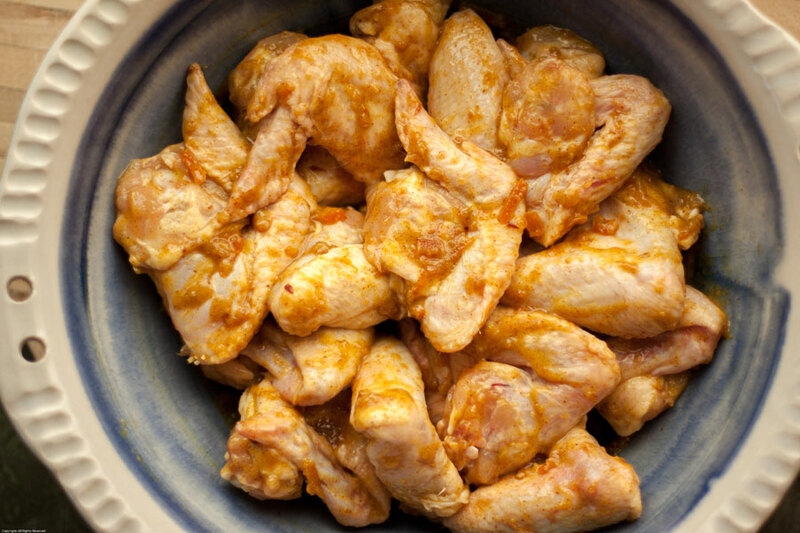 Pile the cooked wings onto a large serving platter. Serve with the reserved glaze on the side. A Salute to Chicken Wings! love that sticky marinade. definitely one i need to try – i actually never have used marmalade to flavour anything savoury before. i can only imagine how good your kitchen smelt whilst this was grilling too! Thanks, Thalia. We love marmalade (especially our homemade Buddha’s Hand marmalade) and use it in all sorts of savory recipes. It works in any dish where you want to add some citrusy/sweet/tart flavor. What a great combination! They sound delicious! Thanks, Lucy. Let me just say that they taste even better than they sound. A must-try recipe for any lover of chicken wings! Let’s be real, homemade wings should be the only wings there are. And I LOVE the idea of doing a different sauce! These look amazing! We couldn’t agree more! We love wings with all kinds of sauces and glazes. If you like wings, check out our other wing recipes, Chipotle Molé Wings and Yuzu Pao Hot Wings, also here on the Earthy Delights blog.